Y.S. 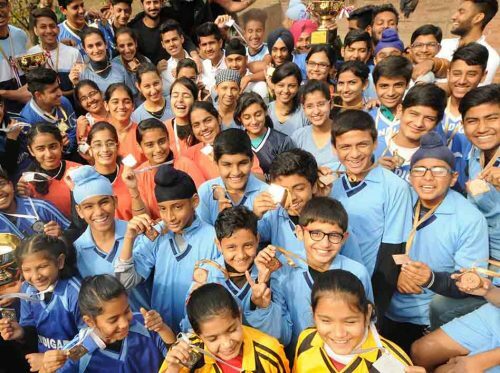 RANA, CHANDIGARH—For the first time, the education department of Chandigarh Administration in a bid to encourage government schools students of Class X and XII to excel in their respective streams introduced policy of giving cash awards to meritorious students. While talking to media persons in his office, Mr B.L. Sharma, Education Secretary, Chandigarh, said that the department has brought a major policy change and decided to give cash awards to the students who excelled in their respective streams. Not only it has provided best possible infrastructure and facilities but also from this year it has decided to give cash awards to meritorious students. Mr Sharma said that the department has announced cash award for meritorious students of Class X and XII for the year 2016-17 and 2017-18. He further stated that the cash award would be given to top three girls and three boys each of Medical, non-Medical, Commerce, Humanities and Vocational Education streams. Thirty-four students who stood first, second and third for the year 2016-17 would be given cash award of Rs 21,000 (First position); Rs 15,000 (second position) and Rs 10,000 (third position), stated Mr Sharma and that for the year 2017-18, thirty-five students would be given cash prize. The education department will distribute a sum of Rs 5,10,000 for the year 2016-17 as cash prize to 34 students. Besides Isha Rawat of GMSSS-37-D who scored 98.60 per cent marks in the Class 10 will be given cash award of Rs 51,000 and Pulkit Gupa ofGMSSS-33-D who scored 95.60 per cent will be given Rs 31,000 who are the first two toppers of Chandigarh, says Mr Sharma. The students will be given cash prize in function to be held on Teacher’s Day on September 5. For the year 2017-18, thirty-five students who stood first, second and third in their streams would be given total cash award of Rs 5,64,000. Mr Sharma also stated that apart from this, 100 students who scored 10 CGPA in their matriculation examination for academic 2016-17 and 98 students who scored more than 90 per cent marks in matriculation examination for academic 2017-18 will also be honored with a cash prize in coming days, says Mr Sharma. “Quality education at affordable price is new ‘mantra’ of Chandigarh Education Department,” says Mr Sharma. In a bid to encourage student community of government schools in their academic, the department has formulated a new policy of giving cash awards to meritorious students each year and Mr Sharma hoped it would go a long way to improve the quality of education in Chandigarh.